With spring in the air I now have the traveling itch. I suppose soon enough I will be on my way as part of a business trip. But that does not necessarily count — as it is still work. So to inspire my next big leisure trip, I will have to watch the title sequence to Up In The Air (2009) instead. 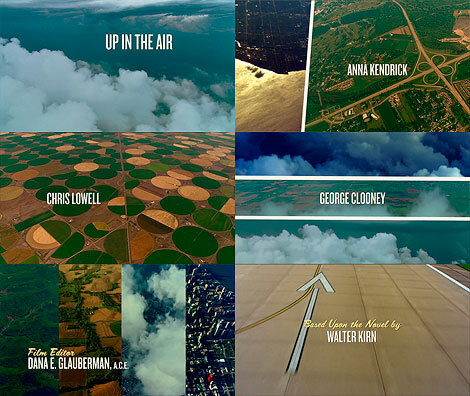 I love how this intro captures the aerial views and the floating feeling when traveling via air. The patterns, textures, and colors can give away what region you are traveling to. The typographic motion also lends to the overall experience. The views play into the contrast of scale - as humans we are big but also very small. *There is a great interview about the making of the title sequence by Shadowplay Studios here. View the official title sequence here.